Commerce is an ancient economical system that enables establishment of legal and ethical foundations, strengthening of social ties, improving cultural relationships, trading values and technology as well as goods on safe and secure routes. Starting from the ages of antiquity until the discovery of the new continent and development of railroads, Silk Road was once the most important route of commerce, a statement of a continuous journey of human knowledge, philosophy, religion, art and architecture, mathematics, science and technology, which had an undeniable impact on the great civilizations of Yellow Rivers of China, Japan, Indus Valley of India, Egypt, Persia, Arabia, the Ottomans and finally the Romans . Extending over 8,000 km, the Silk Road developed interconnected networks linking traders, merchants, pilgrims, monks, missionaries, soldiers, nomads, urban dwellers and intellectuals from East, South and Western Asia with the Mediterranean World, including North Africa and Europe for thousands of years. Similar to the plazas of the pre‐industrial European cities, bazaars were also housing the social, political, cultural and civic activities of people like forums or agoras of the ancient world, however, mainly due to the climatic factors and quality of the goods stored in, they are covered, or covered within time. Although there may be predesigned grid or crisscross exceptions, traditional Islamic bazaars are generally built in time, with expansions in relation to the organic pattern of the city and street layouts. No matter how or by whom, they were built, bazaars had always have connections to important and prestigious religious, governmental or public buildings, and defined the major streets of urban fabric, connecting two major entrances especially of the small cities. Apart from being a space for shopping or socializing, bazaar organizations were formed according to hierarchically developing guild system where apprentice‐master relationship were forming the vertical line, while guilds of various artisans and craftsmen were forming the horizontal line in terms of locations of the manufacturers, merchants and such. 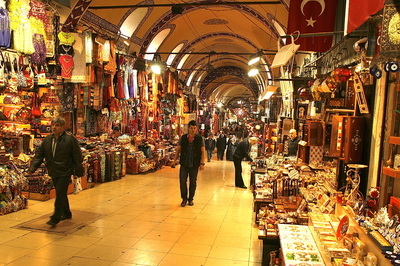 In Turkish social system, covered bazaars are usually built as a part of a larger complex including, hamams, soup kitchens, and such as a source of revenue for mosques, religious or charitable trusts known as vakıfs, where the donated assets cannot be turned over to individuals or institutions. Bazaars of the eastern Islamic world are comparable to plazas in cities of pre‐industrial Europe, or to forum and agora in ancient Roman and Greek cities in terms of forming a place for social, political, cultural and civic activities of people, where one would also find similar facilities in contemporary shopping centres. The difference appears in the covered, enclosed structure of these bazaars, and in the geometric organization in which forums and agoras had centralized form, whereas bazaars were always designed in linear forms, owing mostly to the climatic, cultural and economic conditions of the region. In Turkish system on the other hand, bedesten, the covered and enclosed core building, where the most expensive and valuable goods are exchanged, determines the formation of the whole bazaar, as can be seen in Bursa, Edirne or Istanbul covered bazaars . 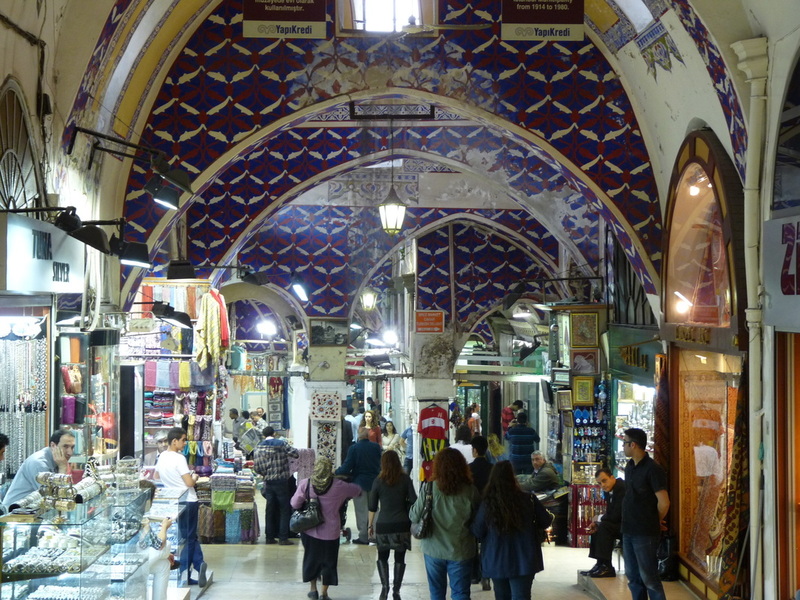 Contrary to usually timber‐framed shops, bedesten and arastas of the Turkish bazaars are predesigned and built in single sessions without any expansion. Since, the ownership status as mentioned before, belonged to the vakıfs, as long as there is demand, and as long as the vakıfs had the capital, shop strips were built within time and the bazaar continued to expand horizontally. The Grand Bazaar was founded in 1461 by Fatih Sultan Mehmet after he had conquered Constantinople in 1453, forming a significant conclusion for the Silk Road, on a site where a Byzantine market was supposedlybeing held earlier probably around Old (inner) Bedesten .First, there were two Bedestens forming the nucleus of the Bazaar; (inner) Bedesten and Sandal Bedesteni. The four adjacent sides and the immediate surroundings of the Bazaar were encircled by hans each of which was a separate unit in themselves. 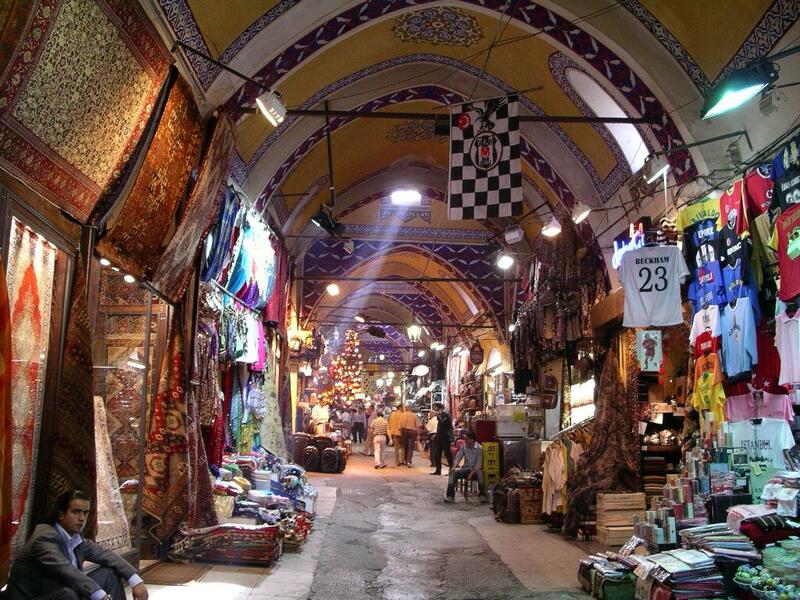 The Bazaar, founded by Fatih, has been improved and enlarged by his successor Suleyman The Magnificent . 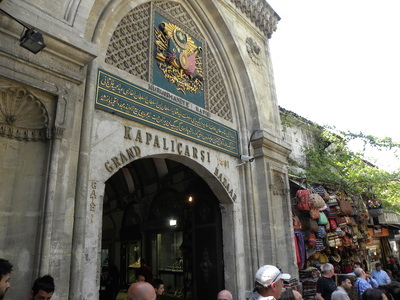 The complex structure of the Grand Bazaar has evolved over the centuries, in 1631, 1701 and 1954 fire made serious damages at the bazaar and 1894 earthquake also destroyed parts of it. The bazaar was reconstructed again and reached its contemporary plan in 1701 ith 64 covered streets, eleven gates and 200000 m² area . The space allocation of Istanbul Bazaar can be defined as a grid based system, where streets are intersecting each other. Grand Bazaar has streets of various length and width. 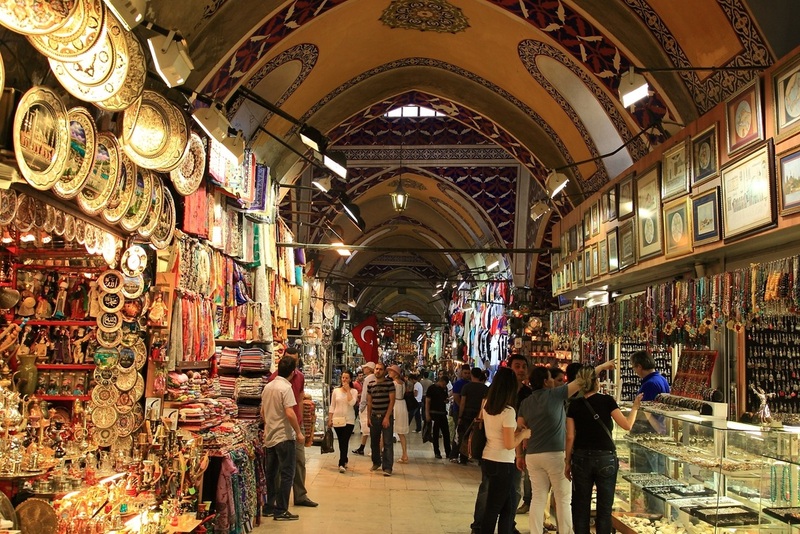 The Grand Bazaar (Kapalıçarsi) is one of the largest covered markets in the world with 60 streets and 5,000 shops, and attracts between 250,000 and 400,000 visitors daily. 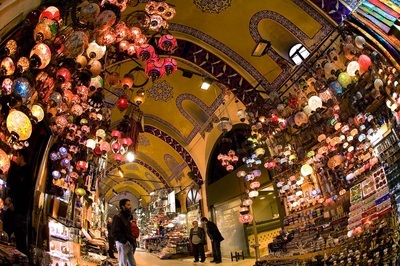 It is known for jewelery, hand-painted ceramics, carpets, embroideries, spices and antique shops. Many stalls are grouped by type of goods. The bazaar has been an important trading center since 1461 and its labyrinthine vaults feature two bedestens (domed buildings), the first of which was constructed between 1455 and 1461 by Sultan Mehmed. The complex houses two mosques, four fountains, two hamams, and several cafés and restaurants. In the center is the high domed hall of the Cevahir Bedesten, where the most valuable items and antiques were to be found in the past, and still are today, including furniture, copperware, amber prayer beads, inlaid weapons, icons, moth er-of-pearl mirrors, water pipes, watches and clocks, candlesticks, old coins, and silver and gold jewelery set with coral and turquoise. Open Times: Monday to Saturday 9:00 - 19:00. Closed Sundays and bank holidays.